Anyone for a Hot Doc? Once upon a time there were twin girls living in the beautiful city of Cape Town. While they were twins, they had very different personalities. Alyssa was carefree and adventurous, while Rachael was responsible and level headed. Due to the gift of good genetics, both were also really beautiful, and very smart. So beautiful and so smart, that both were accepted into medical school, and also offered modelling contracts. Now here’s where the lives of these two girls took a detour. You see Rachael knew that she wouldn’t be able to start modelling and do well at med school, so she decided to focus on her studies, the responsible choice, her family was very proud. Alyssa on the other hand managed to convince her parents that as you only live once, you should take opportunities to go and see what life is all about. And so they went off in their different life paths as soon as school finished. Coming from a rather well off family, both girls were brought up knowing that it’s important to save money, so that you don’t ever end up in a situation where you wake up old and impoverished. They’d heard just too many stories about how Aunty Edith never saved any money, and when she retired from her lucrative career as a chicken sexer, had only enough for a few years before she had to go move in to her son’s spare room. Alyssa was very successful as a model. Right from the word go, every month she managed to save R5000 which she put into a magical super fund, that offered gains of 12% a year guaranteed. Unfortunately, models are kind of like dogs in that they age 7 times faster than the rest of us, so at the grand old age of 26 she was out of work. From then on she had to enter a different line of work, and barely made enough to cover her expenses, so there was no more money added to her magical super fund, and all she had invested was R420 000. As a weird co-incidence, at that exact moment, Rachael graduated. Really, I’m not making this up, it is such a co-incidence! Being a newly white coated Doctor, Rachel started earning decent money, and just like her smart sister Alyssa started investing R5000 a month into the magical super fund. She kept this up all the way until she was 65. In total she had invested a massive R2.4 million. As both girls were still very close, they got together at the age of 65 to celebrate their retirement, purple hair and latest bingo tips, and thought it would be interesting to compare their two totals in their retirement funds while they were at it. So here’s the question reader. 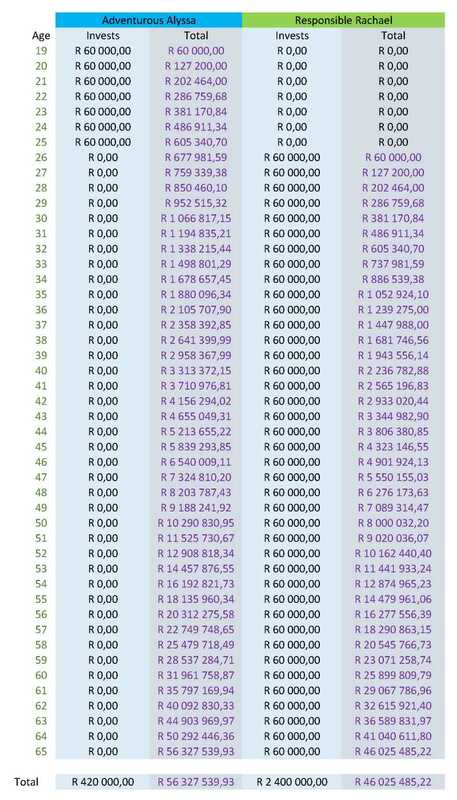 Alyssa contributed R420 000 between ages 19 to 25, Rachael contributed R2 400 000 between ages 26 to 65. Who has the healthier retirement account? Alyssa is better off, by a “I can buy a Porsche and a house on the beach” R10 million extra! Quite incredible isn’t it. The reason that Alyssa has managed to get more money saved is due to compound interest. It’s not magic or wizardry, and doesn’t need to be difficult to understand. All it means, is that you earn interest on money invested, and then you earn interest on money invested, plus the interest on the interest you earned last year. 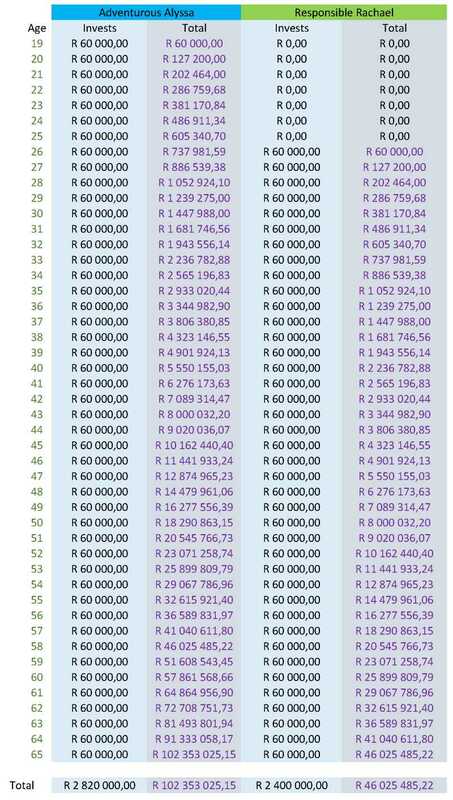 If you look closely at the table above, you’ll see that in the first year that she stopped contributing, Alyssa’s account grew by R72640,89 without her even doing anything. That number is higher that the amount Rachael invested, hence her ability to pull away further and further from Rachael in the total invested. I’ve even run the numbers to age 200, and even then, Alyssa just keeps getting further and further away from Rachael. As it says on the calculator on this site, Einstein once called compounding the most powerful force in the universe. Rachael could just never catch up. You need to understand compound interest. If you don’t, you’re likely to end up paying it in the forms of credit card debt and car loans. If you do, you’re likely to end up earning up in the forms of investments. Money isn’t money. Money is time and money. R10 000 invested today is worth so much more than R10 000 invested in 5 years time. If you don’t have a pension or similar investment, then the best time to start is 10 years ago, or whenever you started earning money. Fortunately for you, the second best time to start is right now! You don’t need to make a lot of money to get rich, you just need to make some very early on. If you can get an early start on your investments, and don’t do anything stupid like cashing in your funds, you are very likely to end up very wealthy. You have a better investment at your disposal than Warren Buffet: Time. You could let time work for you for the next 20, 30 or more years, sadly he most likely can’t, unless he starts using Mugabe’s doctor. Now just for fun, let’s edit the original story. In this do-over, Alyssa is going to go from modelling at 25, to managing a model agency at 26, still earning good money, and still investing. Now how much do you think she’ll be worth? About R56 million more than Rachael has. So investing from a young age, and keeping it up seems to be a good plan! How old were you when you started investing? *Credit where credit is due. The idea for this post came from Vanguard‘s post on compounding, as well as a great article from Dave Ramsey.